When running events for children, you must carefully consider what data you will be collecting. A child’s personal data merits particular protection under the GDPR. Bookwhen's booking forms give you complete freedom to ask for any details so it is your responsibility as the Data Controller to ensure that you ask only what is required. Bookwhen uses the special attendee email field on the booking form to uniquely identify a customer in the system. Children however should not have an email address. An email address is not requested for children, and instead the booking contact email will be shown in the admin pages instead. If you'd like to change the 'Is this attendee a child?' text then you can do so on the booking fields setup page. Your customer's data behind the scenes will then be updated accordingly to separate child data from adult data. Is it a child only event? 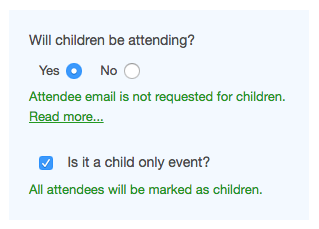 You should tick this box if all the attendees taking spaces are children. If parents/guardians are accompanying children at the event but not taking up spaces at your event, then it's still a child only event.